Priority Level 1 Registration for our upcoming Spring Session (March 26 – June 3) starts Feb. 26, 2018. “Sign the kids up for swim lessons.” These words have lived on the to-do lists of busy parents everywhere. Even though lots of parents intend to sign their little ones up for classes, not many of them actually get around to it. Maybe it never seems like a good time in the schedule. Maybe since you don’t have a pool at your house you figure lessons are not necessary until your kids are older. The truth is, the best time for your children to begin learning how to swim is now. In this review, we will discuss why you shouldn’t wait until your children are older to sign them up for classes. Giving your child the opportunity to learn to swim at a young age takes a lot of work. You have to carve out time in your schedule for class, make the trip, and bring changes of clothes for you and your child. There may even be times when you and your child just don’t feel like it. 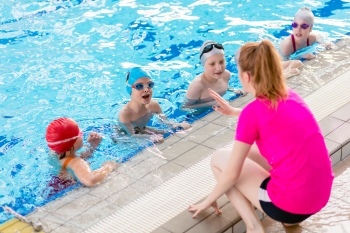 Although swimming lessons might add to your schedule, you have to consider the fact that they could literally save your child’s life one day. Sign your kids up for classes so that if they are ever in a situation where they are in the water unattended, they will be prepared. In addition to saving lives, classes also familiarize little ones with the water. Some kids just do not have an inherent fear of the water. 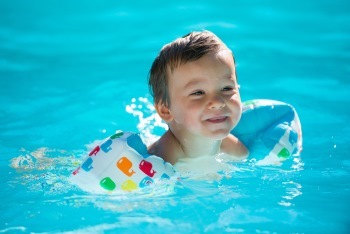 Because of this, little ones may be tempted to enter a pool by themselves out of curiosity or a lack of understanding. This is why registering your kids for swimming programs is so important. Within the first lesson or two, kids begin to develop a respect of the water. They learn very quickly that they can’t breathe under water and that they need mommy or daddy with them at all times. The younger a child can begin learning these concepts, the better. Not only do classes keep children safe and familiarize them with the water, but they also help them stay active. After all, swimming is something that is not just functional, but enjoyable as well. In a time when so many adolescents are wrapped up in technology and staying indoors, it has never been more important to cultivate a love in our kids for outdoor activities that promote a healthy lifestyle. Swimming is excellent exercise and a great way for children to stay active. The younger your son or daughter begins swimming, the stronger swimmer they will likely become. You never know – maybe you are looking at a future Olympic gold medalist! If you are a parent of young children, keep in mind the reasons to sign your little ones up for swim lessons sooner than later. DuPage Swimming Center is a state-of-the-art instructional swimming facility in Aurora, Illinois. We offer swim programs for children ages six months and older. Our goal is to teach every student how to be water safe, while having fun. Having a young child doesn’t mean that you can’t find fun group activities to participate in together. In fact, there are countless ways for you and your little one to have some excitement outside of your home, even when the weather starts to get chilly. If you’re looking fun ways for you and your little one to stay active this winter, you should consider swimming lessons at a local indoor pool facility. For many parents, just the thought of navigating through swimming lessons with their babies can feel overwhelming. Water safety is crucial at any age and parents can instantly feel daunted at the mere thought of attempting to keep their babies safe during their pool time. Beyond safety concerns alone, many parents also worry about their child’s attitude in the water. Children from 6 months to 3 years old can often demonstrate unpredictable behavior, no matter what the surrounding environment, a pool can add a whole new potentially stressful dynamic to their mood. Successfully getting a baby to focus on the lesson and follow the instructor’s lead while in the water can often pose a challenge to even the most attentive parent. As with any parent/child experience, it’s important to effectively plan for success at the pool. If you’re ready to sign up for parent/tot swimming lessons, follow a few simple tips to ensure that you and your little one are ready to get the most out of this time together. What’s the first thing to consider on lesson day: the physical needs of your little one. Making sure your child is well rested can keep her focused and pleasant during pool time. Additionally, while you don’t want to feed children too close to their time in the water, it’s important to always make sure your child isn’t hungry during her swim lessons. Keeping both you and baby comfortable in the water can make a major difference in the overall experience of your swimming lessons. When it comes to indoor swimming lessons, it’s always function over fashion. It’s important to find comfortable, unrestricting swimsuits that allow you to move as needed in the water. Also, if your toddler isn’t potty trained yet, include swim diapers as part of the pool time gear. Perhaps the biggest tips for enjoying time with your child in the water is to simply go with the flow. Take your lead from your young swimmer — when he’s happy splashing around, use that time to work with him to further his skill levels. It’s also important to pay careful attention when your baby isn’t enjoying his time in the water. Many little ones can often feel nervous, uncomfortable or even frightened in the pool. Never push your child to try things in the water that they aren’t ready for. Staying patient and following your child’s lead in the water can help ensure that you keep the entire experience as positive as possible. DuPage Swimming Center offers parent/tot swimming lessons in Naperville for children of various ages and skill levels. If you’re ready to keep active and have fun with your little one this winter, DuPage Swimming Center is THE place to be!